Am I eligible to become a reader at this library? How do I obtain permission to use the reading room and materials? Do I need to set up an in-person appointment to register as a reader? What documentation do I need to bring with me to register as a reader? WHO TO ASK: Usually, this information is available on the library’s website (“Using the Library”; “Using the Collections”; “Using this Library”; “Research at the Folger”; etc.). If you can’t find the information you need, contact reader services (for larger libraries) or the outreach librarian (for smaller libraries) directly. The relevant contact information should be listed on the website. Where is the library located? What are the reading room hours? How do I access and physically navigate the library building? Where do I check in when I arrive? What items can I bring with me into the reading room? Where can I leave my belongings that are not allowed in the reading room? If there are lockers, are they coin or code operated? Where is the bathroom? Are there water fountains in the building? How do I sign into the local wifi network? WHO TO ASK: The answers to some of these questions will certainly be available on the library’s website. As for the other questions, you can ask when you arrive. You may even be informed (by signage, an orientation video, or a member of staff) before you have to ask. How do I find materials I know I want to see? How do I find materials I didn’t know I wanted to see? Are all collection items in the online catalogue? If not, how do I search for materials not in the online catalogue? Can I do this searching off site (e.g., via online finding aids), or do I need to use physical resources in the library (e.g., card catalogues)? How detailed are the online catalogue entries? To what extent do catalogue entries include copy-specific information? How effective is keyword searching in the online catalogue? How do I browse materials using the online catalogue? WHO TO ASK: I recommend directing these questions to the reference librarian (or, outreach librarian, or reader services librarian—the title of this position can vary) as well as to the curator who oversees the parts of the collection you know you will be using. If you are planning a short research trip, it may save library time to take care of this correspondence in advance. If you’re going to be in residence for a longer period of time, I suggest face-to-face meetings when you arrive. A lot of special collections libraries have collection overviews on their websites. These are really helpful starting points, but they do not replace the deep knowledge of the library’s experts. Does the library require readers to set up an online research account to request materials? If so, should I set up my online research account before I arrive? How do I use the online account to request materials? When and how often are materials paged from the stacks? How long does it typically take for materials to arrive? Are all items housed in the same building as the reading room, or are some items stored off-site? How long does it take for off-site items to reach the reading room? How many items can I page at a time? How do I know when the materials I have paged are ready for me to look at? What do I do if an item I want to see is labeled as “restricted” or “unavailable”? WHO TO ASK: You should find answers to some of these questions, especially those about setting up an online research account, on the library’s website. The reference/outreach/reader services librarian, or the staff at the circulation (or, reader services) desk should be able to answer more specific questions about paging timelines and logistics. If an item you are trying to page is restricted or unavailable, the relevant curator may get in touch with you directly. If not, ask to speak with them. Where can I pick up materials when they are ready to be viewed? How many items can I see at a time? Are there any special instructions for handling the materials? Can I take photographs of the materials? Where do I find book cradles, snake weights, magnifying glasses, light sheets, rulers, and other supplies for viewing and studying the materials? What do I do when I’m finished with an item? Where and how do I access reference works (either in hand or online) that can help me with my research? WHO TO ASK: The staff at the circulation (or, reader services) desk will be able to answer all these questions for you. You should also consult the library’s website for written and video tutorials about handling material, as well as descriptions of photography policies. What are the rules about leaving the reading room—to go to the bathroom, stretch, get a drink of water, eat some food? Do I need to return all rare materials every time I leave the reading room? Is there a refrigerator that I can use for my lunch, water, etc.? Is there a break room where I can eat lunch or a snack? Is there a place in the library building where I can take a phone call? WHO TO ASK: The staff at the circulation (or, reader services) desk will be able to orient you. Sometimes this information is made clear when you arrive. Sometimes, though, you do have to ask. What is the protocol for leaving the reading room at the end of the day? Will you keep my materials on hold if I’m planning to return the next day? Do I have to have my belongings checked? If so, which belongings need to be checked and who checks them? WHO TO ASK: The staff at the circulation (or, reader services) desk will be able to explain these procedures. 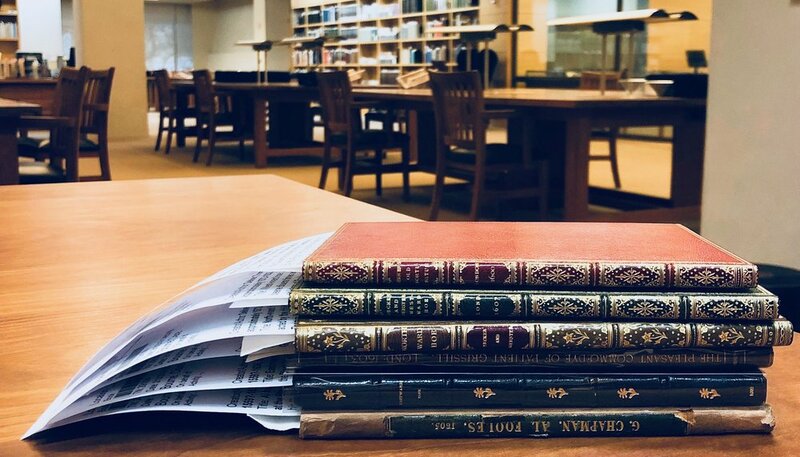 Of course, there will always be questions you didn’t know to ask beforehand that emerge in the thick of your research—especially (I have found) questions relating to navigating the library’s online catalogue and finding aids. Establishing contact with a reference or outreach librarian and the relevant curator(s) at the start of your visit will make it easier to reach out for answers and help when these unexpected questions arise. Finally, this list of questions is based on my personal experiences doing research on the print histories of early modern plays at the following libraries: Kislak Center for Special Collections, Rare Books, & Manuscripts (UPenn); Folger Shakespeare Library; Huntington Library; Bodleian Library (Oxford); British Library; National Art Library (V&A); Wren Library (Trinity College, Cambridge); Worcester College Library (Oxford); Harry Ransom Center (UT-Austin); Beinecke Rare Book & Manuscript Library (Yale); Shakespeare Birthplace Trust; and the Eberly Family Special Collections Library (Penn State). This is all to say that this is certainly not a comprehensive list. There are questions, no doubt, that I have not thought to ask because of what I research and where I research. So, I invite you to add your must-ask questions in the comments below. I’d also love to hear from librarians, curators, and other library staff about the best questions they’ve been asked (or wish they were asked more often). Huge thanks to Aaron Pratt and Eric Colleary at the HRC; to Kathryn James, Moira Fitzgerald, and Sara Powell at the Beinecke; and to Anders Winroth, Eve Houghton, and Ryan Martins at the Elizabethan Club for orienting me, facilitating my access to their respective collections, and patiently answering my all my questions. I am also grateful to the circulation desk and paging staff at the HRC and Beinecke for dealing with my abnormally high volume of requests.